“All hands on…DRUM! 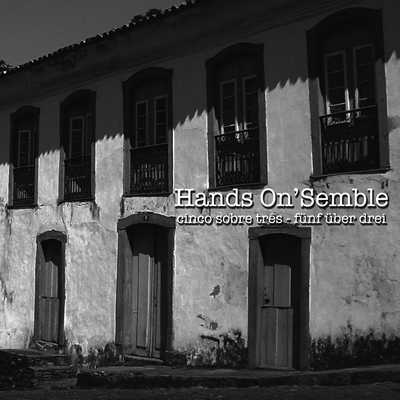 Core founding members Randy Gloss, Andrew Grueschow, and Austin Wrinkle (originally founded with John Bergamo) collaborate with percussionists Pete Lockett and Poovalur Sriji on this, their fifth CD as the internationally acclaimed world percussion group Hands On’Semble. From the opening track, rhythms are flying with mind-bending precision. The collaborative works with Lockett and Sriji are fantastic additions, adding depth to the ensemble’s core sounds. Lockett’s electronics and drumming provide a modern edge that is satisfying. Poovalur Sriji, the legendary percussionist, composer, and educator (also, a mentor for the group) is well known for blending Indian Classical music and Western musical systems. His composition, “Sweet 17,” not only features his world renowned mridangam playing, but also showcases exquisite playing by B.U. Ganesh Prasad on violin, Eric Barber on saxophone, and Kai Kurosawa on beartrax (tapguitar). Each original member has a feature on the fourth track, a classic Hands On’Semble composition, “X-Mas in Goa” (originally recorded on Shradhanjali in 2001). Revamping an old tune is a great way for listeners to see how far they have come. Randy Gloss’s four-minute pandiero solo is particularly stunning as he takes the listener on a rhythmic journey through Brazilian traditional rhythms to rock, urban hip-hop, and drum’n’bass, all through the aural lens of his traditional Brazilian pandiero. The group’s expertise has always been a blending of rhythmic compositional forms and techniques from a wide array of world drumming traditions, while at the same time bridging these various instruments/traditions into a unique, seamless musical amalgam. This is their most developed and mature album to date. Get your hands on this CD!